It’s amazing how memory can be tied to objects. The sight and touch and smell of something that you haven’t seen for many years can bring back a flood of memories that may have otherwise been lost forever. Sometimes the experience is so vivid it’s almost as good as time travel. Ah…a reference to comic 47. No kidding. When the Jalepeno and Cheese Doritos came out I was having a conversation with a coworker about it and he mentioned a long since discontinued flavour called Salsa and Cheese. Immediately after him saying this I actually had a taste flashback. I loved those Doritos as a kid, and reminding me of them actually brought a recollection of the taste, and I wasn’t even eating anything at the time, which is the first time I can really say that has happened to me (other than x tastes like y and similar taste comparisons). Well I can’t really say this has happened to me, since I’m still young really, but somehow Lethal interjections co reminded me of how I once actually tasted something I ate in a dream, the taste didn’t last long, but it was wonderful. This reminded me of Johnny Mnemonic that is all. May 1977 hey. Do my sensors detect another star wars fan? I’ve noticed that myself and have often wondered if our memories really are tied to objects. Sometimes, a memory will never seem to reoccur until you’ve come across an item that triggers the memory. How OLD was Biff in 1977? Does that thing go in his forehead VCR? I haven’t lost my mind. It’s backed up on tape somewhere. I like how the title of today’s strip is also a pun. “Trip” as in “trip down memory lane” anyone? I also like the reference to an older comic. I would’ve missed it if Torg hadn’t pointed it out–thanks Torg! I can definitely relate. Mostly, during long car rides, if someone says something funny, I’ll always relate what i was looking at at the time to that joke. Like a certain tree, for example, if I ever see that tree again I’ll be reminded of the joke. Long time lurker (since the 2nd comic) first time poster. Same thing happened to my dad. We were driving down to Capone’s a pool/bar to well go play pool, and the song Night Moves came on the radio station 94.9 The New Eagle. Next thing I know my father stops in mid-sentence and nearly drives us off the road as he was having a flashback to his childhood. A lot of memory is tied to our sense of smell. Enough so that people who lose their sense of smell also lose access to a lot of their memories. Actually, I guess this has happened to me, often when I’m playing a game, if one of the times I was playing the game, there was a show on, I’ll be reminded of the same episode that was on. what about the reference to comic #554? and I wonder how a stray toaster got into his house? It happens to me a lot with music. I was once on a bicycle trip with some friends, and listening to a lot of Café Tacuba (Re). For a couple of years later, whenever I played that record, it brought memories of that trip. Also, on a different trip, I had no music to listen to, but the music I missed then and thought about, when listened to later, reminded me of that particular trip. On an entirely different note, have you thought about some designs for t-shirts and such? Never had sight remind me of something thought lost, my most vivid experience was with a taste, Barq’s Rootbeer. Even to this day it reminds me of star wars roleplaying in middle shcool. 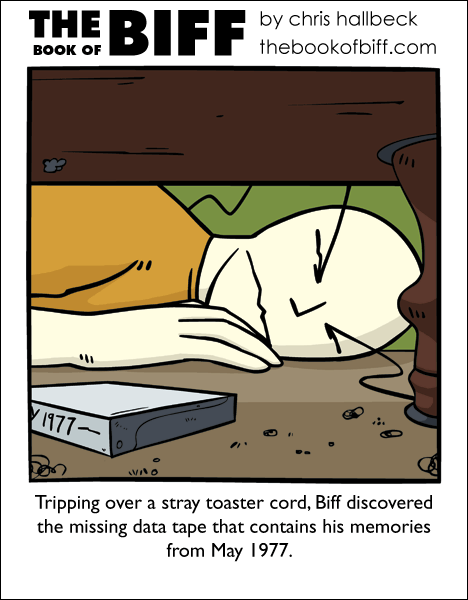 Toasters seem to play a significant part of Biff’s life. The taste of Mt. Dew in a can reminds me of D&D in high school. As does Orange Crush. wow i remember things out of nowhere like i remember bein in the nursery when i was still a baby watching my grandma take care of everyone…. I can’t find a third reference in here; if you’re thinking #554, I think you’re interpreting “stray toaster cord” a little too literally. Don’t ya just hate it when somehow a song gets tied to a bad memory? I was listening to Queen’s “Bicycle” while I was ironicly riding my bike. That rarely happends to me. My memory seems to only extend five years. Beyond that it’s as good as gone. Some one else can explain to me what happened but all I get are vague images that have no substantial value at all. The result is I now have large collection of junk that I don’t know how I got, have no Idea what they’re for and can’t bring myself to throw away because they I have a vague sentimental value to me, yet I have no Idea why. Aha! A DOUBLE callback comic!